A 90-year-old great grandfather-of-four has been left ‘vulnerable and isolated’ after he was involved in a collision with a reversing car in Battle High Street. The man was walking to the Co-op at 7.28am on Friday (November 9), when he was hurt by a Peugeot 307. His daughter Christine Maynard, 64, said the collision left her dad lying in the road with a fracture to his left knee and cuts and bruises. Sussex Police said the driver and passenger of the Peugeot left the scene without providing details. Christine said: “My dad had lived on his own until this accident and now he is not able to cope because he is vulnerable and isolated. “The people who did this to him are the scum of the Earth. Since the incident, Christine and her sister Avril have moved in with their dad, Ken, to help him. Christine added: “He spends most of the time in his wheelchair now. “He cannot mobilise himself and he needs us here to get him to the toilet. Christine said the incident was witnessed by two men who rushed to her dad’s aid. She added: “I just want to thank them so, so much for what they did for my dad. 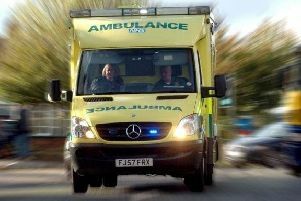 “The Co-op staff were brilliant and stayed with him until the ambulance arrived. PC Stu Ball, from Sussex Police road policing unit, said the driver of the vehicle has been located. He added: “Within an hour we were able to trace the car to an address in Battle where the 73-year-old owner admitted that he had no insurance in place for it. The vehicle was seized by police and the man was issued with a traffic offence report.